In two years from now, coastal India will have three jewels buried deep underground. India Strategic Petroleum Reserves, or ISPR, a government company, is building three huge caverns beneath the earth that can hold 14 days worth of India's oil consumption. The storage, carved out of underground rock at Mangalore and Udupi in Karnataka, and Visakhapatnam in Andhra Pradesh, will be buffers against short-term disruptions. India already has storage for 74 days of oil consumption. Imports account for three fourths of India's energy needs. The new facilities will have a combined capacity of 5.33 million tonnes (39 million barrels). Rajan K Pillai, CEO of ISPR, says the three projects were to cost Rs 2,397 crore, according to a September 2005 estimate. But the final bill could be Rs 3,800 crore. The first such rock cavern was built at Visakhapatnam in December 2007, by stateowned Hindustan Petroleum Corp and Total of France. 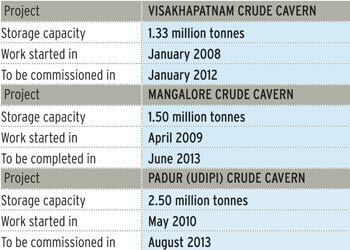 "The new caverns have larger crosssections than the one in Visakhapatnam," says Pillai. At the existing Visakhapatnam facility, the cavern roof is 162 metres below mean sea level. Keeping petroleum products underground has advantages - they are safe from external fires, sabotage, explosions, even earthquakes. "Caverns require very low maintenance. Beyond a certain capacity, the capital cost per tonne of storage is low," he adds. Large consumers such as the United States, China and Japan maintain massive reserves, not only for strategic purposes, but to buy when there is a dip in prices and release when prices rally.